They’re fun, they’re flexible, they’re shish kebabs! 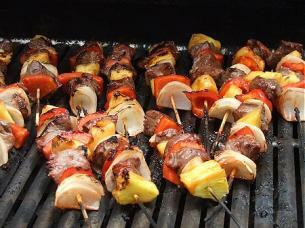 Shown above are Glazed Beef Kebabs with Onion, Red Pepper and Pineapple, courtesy of Chick in the Kitchen. There’s something mysteriously alluring about eating meat off a stick, which is why shish kebabs are always a hit. The term “shish kebab” is said to have Turkish and Armenian roots, but the concept of eating skewered meat has fans around the world. From Greece’s souvlaki to Indonesia’s heavenly satay with peanut sauce, there seems to be a version almost anywhere you go. What’s in a Shish Kebab? Some kebabs involve only meat, while others combine meat, vegetables, and even fruit. The meat can be marinated, then cut into bite-size chunks (about one-inch square), or simply seasoned prior to cooking. If the kebab involves only meat, the meat can be cut into a long strip and then threaded on the skewer. Other meat-only kebabs are made with ground meat that’s shaped around the skewer, in a sort of hot dog shape. Aside from being simple to make, shish kebabs allow you to cook meat and vegetables together in fun, portable format. With a side of rice or couscous, you’ve got a great meal. Another bonus is that you don’t have to follow a recipe. If you’ve got some meat (or shrimps, fish, or tofu), you can marinate it (or not) and thread it on skewers with any combination of vegetables you like. The marinade could be bottled Italian dressing, or Teriyaki Sauce, or something of your own creation. Some meats and vegetables work better than others on a skewer. Look below for a list of kebab-friendly ingredients and basic cooking instructions. Below that, you’ll find some links to a smorgasbord of shish kebab recipes. How do I Prepare Shish Kebabs? Soak wooden skewers (available at most supermarkets) in water for at least half an hour before cooking, so that they don’t burn, or use metal skewers. Cut shish kebab ingredients into bite-size pieces. To give the meat more flavour, marinate it for at least half an hour. Seasoning the meat just prior to cooking is another option. Wash and cut vegetables or fruit into bite-size pieces. Thread your meats and veggies using two skewers instead of one. That way the pieces won’t tend to swing around the skewer and there’s less chance it will break off. Thread ingredients on two skewers, alternating meat and vegetables. Kebabs can be grilled, broiled or baked; cooking time will depend on the method of cooking you choose. If you’re grilling, it typically takes 15 minutes with a flip halfway through. Spray the grilling or cooking surface with oil to help prevent sticking. There isn’t really a recipe for these Glazed Beef Kebabs with Onion, Red Pepper and Pineapple, but the picture is inspiring and this post illustrates the flexibility of shish kebabs. Chick in the Kitchen explains that rather than marinating the meat, she glazes it with a mix of two bottled sauces. If you can make hamburger patties, then you’re ready to try these exotic Lamb Seekh Kebabs from Chef Jeena’s Kitchen. These are meat-only kebabs, made with ground lamb and several spices that’s formed around skewers. Her photo tutorial makes the process crystal clear. Here’s one for Greek-style Chicken Souvlaki. A head’s up: the recipe calls for the meat to be marinated at least four hours before cooking. There are no vegetables in sight here, but feel free to add some if you like. If you’re feeling more adventurous, go for this Rosemary Chicken Skewers with Berry Sauce. The chicken marinates for only an hour, but there’s a berry sauce to make on the stove. The writers describe sopping up the sauce with anything they can get their hands on, though, so it must be worth it! Little Spatula’s Lemon Chicken Skewers demonstrate that a marinade can consist of two simple ingredients: lemon juice and olive oil. Fish tastes great on a stick, too. These Tarragon Salmon Kebabs with Sour Cream Sauce don’t need to be marinated ahead of time. You brush on an oil-and-vinegar mix prior to cooking, then get to dunk the finished product into the sour cream sauce. Try shrimp kebabs done Italian-style. In this simple recipe for Shrimp Brochettes, the shrimp are marinated with breadcrumbs, and then cooked. You can combine salmon, shrimp and vegetables in a single teriyaki kebab as the Cook Mobile shows. Rachel Ray gets the prize for originality: these Chip-Encrusted Chicken Skewers are marinated in a yogurt-based mix, then rolled in potato chips (kettle-style, no less). Thread the chicken pieces on skewers, alternating with grapes. If you’re having a party, consider setting up stations of kebab ingredients and letting guests do the assembling. Here’s a DIY Kebab Party guide from Food and Wine. Kebabs are especially fun for children to make. One extra tip…. thread your meats and veggies using two skewers instead of one. That way the pieces won’t tend to swing around the skewer and there’s less chance it will break off. There are some really great tips here on making shish kebabs! I’m mortified. While my chicken souvlaki recipe is meat only, it never occurred to me you’d eat them without a Greek salad on the side. Guess I’ll be blogging about veggies for the next while to make up for all my meat and dessert posts. Thanks for the shout out. Your site looks wonderfully fun and informative — the prefect recipe for inspired cooking. My husband, (a major carnivore!) considers Shish Kebabs with no veggies – PERFECT! BTW – for everyone here at startcooking.com who does not know how to make a Greek salad, start with some nice crisp lettuce, add some sliced tomatoes, black olives and feta cheese, top with oil and vinegar dressing and ENJOY! CC, that’s my version! How would you make a Greek Salad? Each ingredient should be on its own skewer, because each ingredient has its own cooking time. Sure you don’t get the same presentation, but what good is presentation if the food isn’t just as great? While some vegetables may take 10-15 minutes, some such as zucchini grills up nicely in about 4-6 and to get your meat to medium-rare should only take about 8. Some vegetables even tell you when to take them off like cherry tomatoes, which are ready as soon as they split. Grilling eggplant can be tricky, due to their high water content so if you pull some out first, they will grill much faster. Start by taking out a sheet pan and placing a cooling rack on it. Slice your eggplant into rounds (don’t quarter them yet, its easier to work with in larger pieces now) place on the rack and cover with an even layer of kosher salt. Let stand for about 20 minutes. Once your twenty minutes are up, give them a rinse, pat the down with paper towels, quarter the rounds, then toss in a bowl with olive oil, salt and pepper, or your seasonings of choice, and you are ready to grill. If you are going to grill sausage, you should really poach them first. If you have cooked sausage before, you know that once they get to high heat, they like to spew fat, causing flare ups on your grill. Poaching them first will greatly reduce this. Take a medium pot and fill it half way with cold water, add your sausage and hut it on high. Once it reaches a boil, take it off the heat and let the sausage sit in the water until it has returned to room temperature. Potatoes are great on the grill but they also require some prep work. I find waxy potatoes grill up better, so pick up some red or yellow (yukon gold work nice) and we can start blanching them. Put the potatoes in a large pot with cold water and bring to a simmer, cook until tender (5-10 minutes depending on size.) Remove and they should be ready to grill. These are fabulous tips that I know everyone will find helpful! How would I make a Greek salad? My version is fairly similar, only with cucumber added to the greens and oregano in the dressing. For the dressing I use red wine vinegar and / or lemon juice. A lot depends on what’s in the fridge. When I was in Greece, I never saw the lettuce version, so sometimes I do something a little more “authentic”. Just toss tomato wedges, cucumber slices, red onion slivers, black olives and feta in the dressing and sprinkle with oregano. I like lots of fresh oregano best, but dried works nicely. Just use less of the dried. Thanks for the great Greek Salad recipe! Yours sounds much more authentic than mine! I love using fresh herbs. They are so flavorful and plentiful over the summer months. Thanks for posting this. I have a medical job in Saudi Arabia and love to host parties for colleagues in my free time. These kebabs will be a hit! Great tips and wonderful list of recipes! Thanks for the info. Super post and blog!